Yeah, I know, Marvel's Iron Fist series isn't really a favorite among fans. A lot of fans just aren't happy with how the character has been portrayed in these Netflix series. But, that doesn't mean there isn't any room to learn from the mistakes they've made with the character and do better! The character is set to appear in Luke Cage Season 2 before we see him back in action in his solo second season. Thanks to That Hashtag show we now have an idea of who the main villain might end up being. 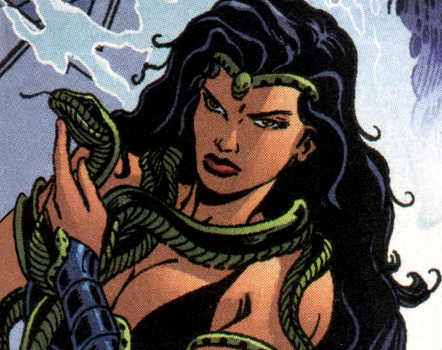 Lady Gorgon - Tanya Adrian is a top assassin of The Hand, and also a telepath able to manipulate minds, posing as their dead loved ones (as she did to The Punisher) or forcing them to experience the deaths of others. Her connection to The Hand and mental manipulation skills would make her a formidable threat for the Iron Fist. Black Mamba - Tanya Sealy was an ex-call girl who got into a criminal operation with Roxxon. She was surgically enhanced to be given slight telepathic powers, able to smother opponents' minds with a deadly energy called the darkforce. There are definitely some similarities between the characters but if I were to place a bet on who I think it might be, I'd have to go with Lady Gorgon. Well just have to wait and see. One thing that I'm hoping to see in Iron Fist Season 2 is another team up with Luke Cage. Iron Fist season 2 starts shooting in a few weeks. Who do you think this Tanya Parker character will end up being?